The tagline, "All the way, means all the way," coincides with "Together, all the way," Cigna's global positioning message. BLOOMFIELD, CT: Cigna launched its first ever international brand campaign, targeting young, global, mobile individuals as it seeks to grow its business in key international markets. The campaign will run in an integrated digital marketing format using channels such as Facebook, Twitter, and Youtube. "Going away to a different country is always adventurous and exciting," said Stephen Cassell, Cigna's global branding officer, "but no matter where people go they will always have their phones on them, so we felt a digitally-led approach was the most appropriate way to engage our target audience." In addition to the U.S. market, Cigna, based in Bloomfield, Connecticut, offers insurance services in Canada, China, India, New Zealand, South Korea, Taiwan, and Turkey. The global market is a key growth area for the company, which reported that its global customer base grew 4% to 15 million customers in 2015 compared to the year before. The target demographic for this campaign is expatriates living abroad, on both long-term and temporary assignments, who need help navigating their local medical systems. McCann Worldgroup handled brand strategy and creative for the campaign. OMD, Cigna's media agency of record, led planning and buying for the global campaign. Budget was not disclosed. The tagline, "All the way, means all the way," coincides with "Together, all the way," Cigna's global positioning message, which aims to convey the company's overarching goal as a health services and insurance company. "These two phrases are applicable anywhere in the world," said Cassell, "and we viewed that connectivity from a strategy perspective, using it to emphasize the importance of having a trusted health insurance partner that will go above and beyond for you." The campaign is comprised of a series of 30- to 60-second ads that will run in Hong Kong, Thailand, Indonesia, and Spain. 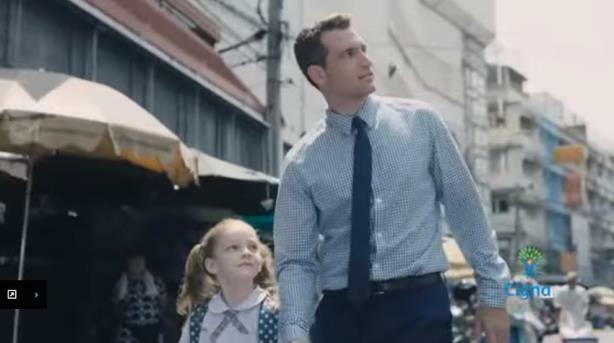 One of the ads, First Day, features a father and his young daughter who have recently moved to a new country for his career. Before he begins his first day of work, the father drops his daughter off for her first day of school. As the pair excitedly navigates the unfamiliar surroundings of their new home, the father is shown searching for a local pediatrician on his cellphone using Cigna's mobile platform. The campaign is aimed at the increasing number of Americans working overseas. "We'll be able to help connect customers to the local medical systems as they engage in other important things and adjust to their new environment," said Cassell.